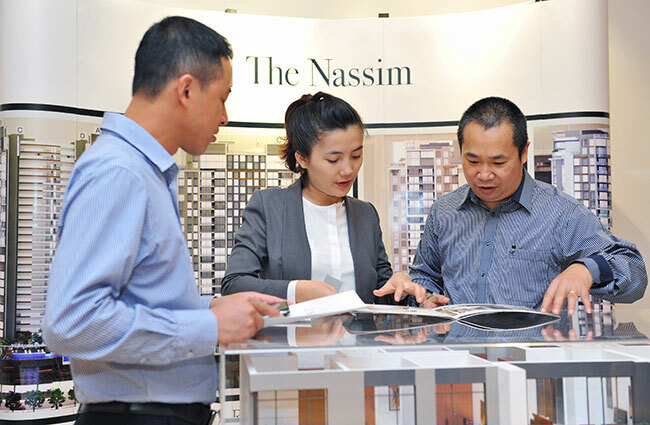 The Nassim, a luxury condominium jointly developed by Hongkong Land and SonKim Land in Ho Chi Minh City, has sold over 90 per cent of the released units in a private preview event which took place on October 31. In addition, two penthouses of over 450 square metres, each with a private swimming pool, sauna, BBQ area on a large sky deck, were sold. The highest price was over VND80 million per square meter (exclusive of VAT). This private preview event marks the opening of initial sales for The Nassim, which is bringing some of the best features of what Hongkong Land has been doing in other luxury developments around Asia to Vietnam. The Nassim is a luxury condominium project comprising four towers with 238 residential units ranging from one to four bedrooms and penthouses. Located in the heart of Thao Dien in District 2 of Ho Chi Minh City, The Nassim enjoys magnificent panoramic views and the serenity of the Saigon River. The development is fringed by an exclusive enclave of low-rise private residences; and is conveniently accessible from the Hanoi Highway. Nearby community amenities include various top international schools, shopping malls, medical care centres/clinics and some of the highest rated restaurants in Ho Chi Minh City. The future An Phu metro station is under construction and is within a short walking distance. Hongkong Land is a listed leading property investment, management and development group which owns and manages almost 800,000 square metres of prime office and luxury retail property in key Asian cities, principally in Hong Kong and Singapore. Its Hong Kong Central portfolio represents some 450,000 sqm of prime property. It has a further 165,000sqm of prestigious office space in Singapore mainly held through joint ventures, and a 50 per cent interest in a leading office complex in Central Jakarta. The group also has a number of residential and mixed-use projects under development in cities across Greater China and Southeast Asia, including a luxury retail centre at Wangfujing in Beijing. In Singapore, its subsidiary, MCL Land, is a well-established residential developer. Hongkong Land Holdings Limited is incorporated in Bermuda and has a standard listing on the London Stock Exchange as its primary listing, with secondary listings in Bermuda and Singapore. The group’s assets and investments are managed from Hong Kong by Hongkong Land Limited. Hongkong Land is a member of the Jardine Matheson Group. SonKim Land is a leading real estate investment and development company based in Ho Chi Minh City. SonKim Land specialises in high-end real estate products in three key sectors: residential, hospitality, and offices. The company's strategy in residential developments is to focus on the luxury and high-end segments. Its projects include Gateway Thao Dien, The Nassim, Indochine Park Tower, Empress Tower all in Ho Chi Minh City, Sentinel Place in Hanoi and Blue Ocean Resort in Phan Thiet, among others. At the Vietnam Property Award 2015, Gateway Thao Dien won prizes in the Best Condo Development in Vietnam and the Best Luxury Condo Development in Ho Chi Minh City. Gateway Thao Dien was also one of six finalists at the Southeast Asia Property Award for Best Condo Development in the region and received the Highly Commended Award in Singapore in October 2015.